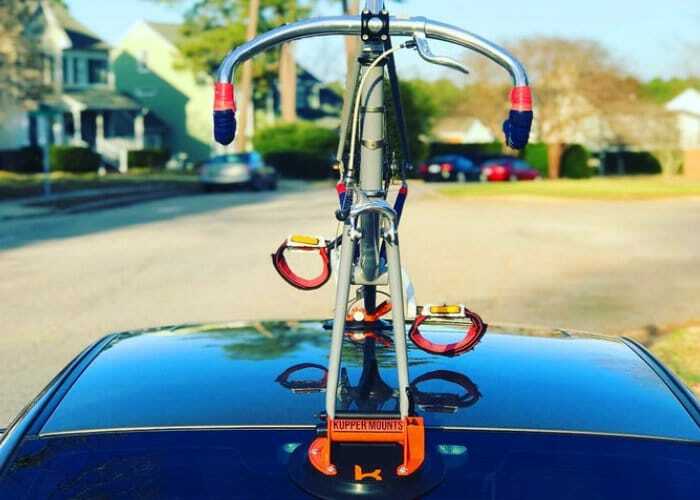 Cyclists searching for an easy way to transport either a mountain bike or road bike may be interested in a new solution created by Andrew Jarrard called Kupper Mounts. Watch the demonstration video below to learn more about the versatile mounting system which can be used on the roof of cars, convertibles or even in your apartment to keep your bike safe while not in use. – One of the most portable, convenient, and affordable bike racks on the market, bringing you the freedom to take on any adventure. – Works for both road bikes and mountain bikes. Any bike 45 pounds or less where the front wheel can be removed. – Transport your bike from adventure to adventure easily and safely. – Kupper Mounts may look small, but they are mighty. Utilizing vacuum technology, these mounts can handle weights that far exceed your expectations. – At Kupper Mounts we are all about building the biking community. For more information jump over to the official Kickstarter crowdfunding campaign page where the Kupper Mounts are now available for early bird backers priced from $89 or roughly £68 offering a $59 discount off the recommended retail price which will take effect after the close of the Kickstarter campaign. If all goes well worldwide delivery is expected to take place during December 2018.